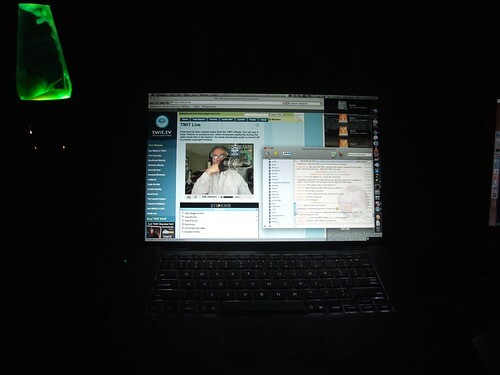 Rubenerd: Watching Leo Laporte at 0400! 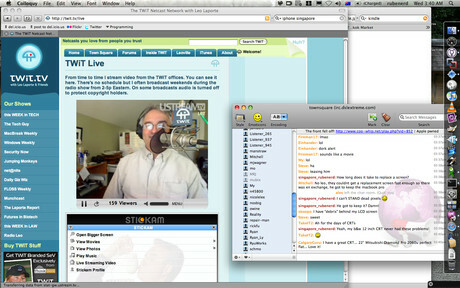 Watching Leo Laporte at 0400! The problem with living in the 0800+ time zone (Singapore, China, Hong Kong, Perth etc) is that aside from Australia most cool English-language produced stuff online is either in Western Europe or North America which can be problematic for someone here when shows are broadcast live… over there! It means I either need to get up at a ridiculously early hour or go to bed at a ridiculously late hour which for someone who has lots of stuff to do all the time is not always feasible! Nevertheless I can now add TWiT along side the Whole Wheat Radio morning wheat berry broadcast from Alaska to my list of shows I've stayed up late for, and have stuffed up my sleeping and work patterns for the whole next day! Watching Leo Laporte at 04:00am Singapore time! I watched Leo Laporte record the latest episodes of Security Now and MacBreak Weekly using his UstreamTV feed on the TWiT website; it was wild! Better still for the first time I also joined the irc.dslextreme.com IRC chat room with Colloquy and not only was able to send messages to Leo while he was editing the shows which he replied to but I also subscribed to a whole bunch of cool new people from around the world on Twitter as well! One of the people on IRC suggested that this is real Reality TV! I'd rather watch Leo editing audio files and taking about cool stuff with his listeners after the recording is over than some sleazy and predictable reality TV show on a network or cable TV channel. Then again that's really not saying much is it? Leo, I didn't mean it like that ;). It is a great system because I can't watch The Lab with Leo here. Fortunately I'll be able to when I go back to Australia for my final year of uni. So a big thanks to Leo for showing me what it's like to record and edit your fine shows, was lots of fun :). Now I just need to figure out next time if it's worth going to bed early and waking up at 04:00am instead of staying up that late. Hey, I could listen to Whole Wheat Radio, then watch TWiT. Who needs sleep? Newer post ← Australia 2007 &#8211; No more John Howard!